So I have to ask-- where did another month go? March came in like a lion, left like a lion, and April came in like a lion, and appears to be leaving like a lion here today. All that makes for great sewing days, but I was in bed with the flu for the first week of this month, at least! It hasn't been a super productive month, but I've tried in life to be more accepting of what I can accomplish each day--it's never enough, is it? 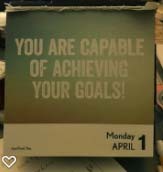 So if you agree with my inspirational calendar, just take a look at what day this sentiment falls on and that's what it's been for me lately! After digging through my scraps for cherry applique fabrics, I decided to do a little spring cleaning-- washed up all my red scraps and the good news is I have room for more fabric! I'm going to go through in rainbow order until they are all neatly stowed. While sick in bed, I did manage to complete the applique on "Mon Cherie." I'm feeling pretty good about it-- it's all "bowl of cherries" on this one. Now it's time to make the open lattice that will fill the blue area-- I need about 100 1/2" tubes, which are then turned, pressed, woven, and glue basted on top of a paper template I made. ...mostly so I will remember myself how it did for the bigger piece-- LOL. We're not going to write the pattern for this, but if you have the Cherry Zen design, you can just blow the photo up and copy it-- be my guest. We also just finished another Zen design, The Curated Carrots, and really, any of those zen designs would make the center of a fabulous medallion quilt of your own imagination. I found the perfect fabric for "Mon Cherie's" backing in JoAnn Fabric, while looking for the perfect backing for a QOV my friends and I are making for Memorial Day, which I didn't find. In more San Francisco Stitch Co. news, we started a new FREE stitch-a-long... the link is at the bottom. 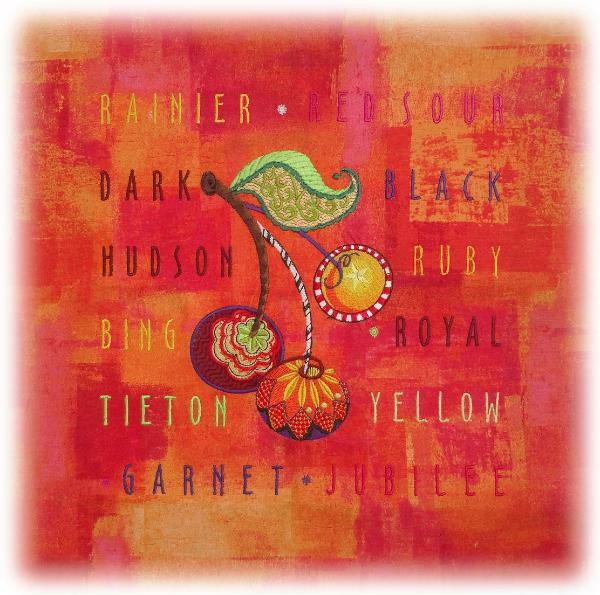 It's a sister piece to "Autumn Twist," yup, it's "Spring Twist!" We are again using Superior Thread's beautiful tweedy twist colors, but you don't have to-- any pastels would be fabulous. We found a white on white polka dot for the background. stitch-a-longs by the end of the year! Why do they always leave one? We're also finally starting the #14 Cloud Club Bird! After seeing the hardship and flooding in Nebraska, we're working on the state bird, a Meadowlark. It's a beautiful bird with all kinds of stripes and dots and a striking yellow chest with a black band. The state flower is goldenrod-- I have never thought of all the individual yellow buds on a stalk until I decided to digitize them. So be patient, Between stripes, spots, and buds it's going to take a while! and hope your world is peaceful and warm. It is embarrassing to look at the date of my last post-- I assure you, it is not because nothing is happening here-- quite the opposite is true! I am going to pack this blog with less blather and more visual delights to make it up to you. ... "Beacoup de Bouquets," which was supposed to be a show quilt this year but is still wrapped up like a burrito in a dusty corner. ... my absolute favorite, beach roses, and I am throwing in some of this vetch pea vine thing that I can never eradicate from by garden but on closer look is very beautiful. These are BIG borders-- like 60" long in all, so multi-hooping, and while we will probably make the borders for sale for your own project inspiration, no, we are not writing instructions for the lattice borders, mostly because they haven't been invented yet! The Zen designs are not top sellers, but they do have a select set of very discriminating fans and we love to do them. Hoping to have carrots for Easter! It's always fun to look up the names of the fruit and veggie varieties when we digitize the border and it's always surprising how many you have heard of, but also, how many you have never heard of! Anyway, we are making a small finished piece out of that Cherry block with fabulous Cherry borders. It was so enjoyable to do the fabric pull on this. On the machine cross stitch front, well, everyone loves it, so we're already sketching out a TON of Christmas stuff... we're hoping for a whole series starting in September with, you guessed it, some free stitch a long tie-in. So fun to see what you make. On the left, we have it when I freed it from the box it was living in for ten years, the middle as it exists now, and the right is the picture of the finished stocking. So you can see that progress has been made. My ever supportive husband commented that I am almost finished, but when I showed him the finished photo and he saw all the french knots in the chair, he said, "Looks like you still have some wood to chop there." 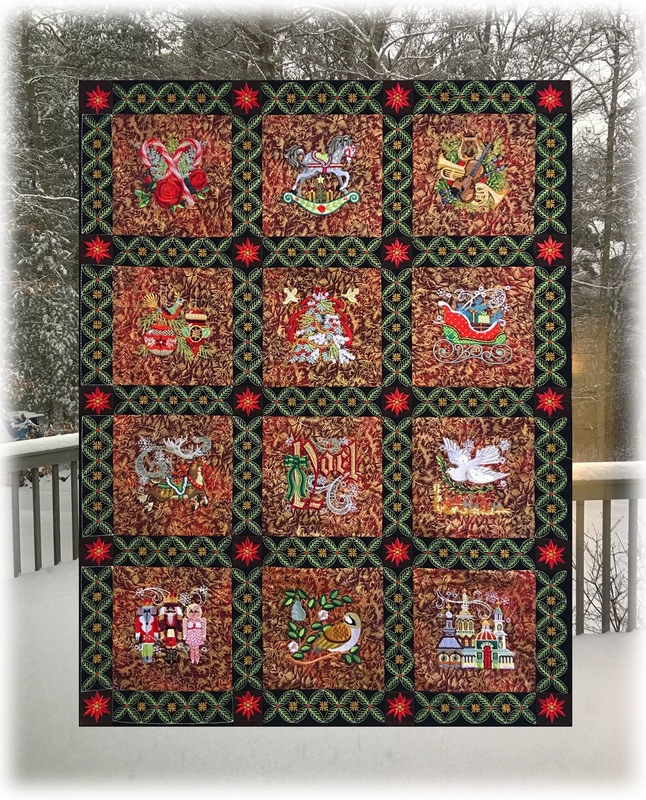 This is just a short post to explain some of the Christmas Album finishing options-- at some point, we fell in love and upgraded this whole project to show quilt status, and it's taking more time than we planned. 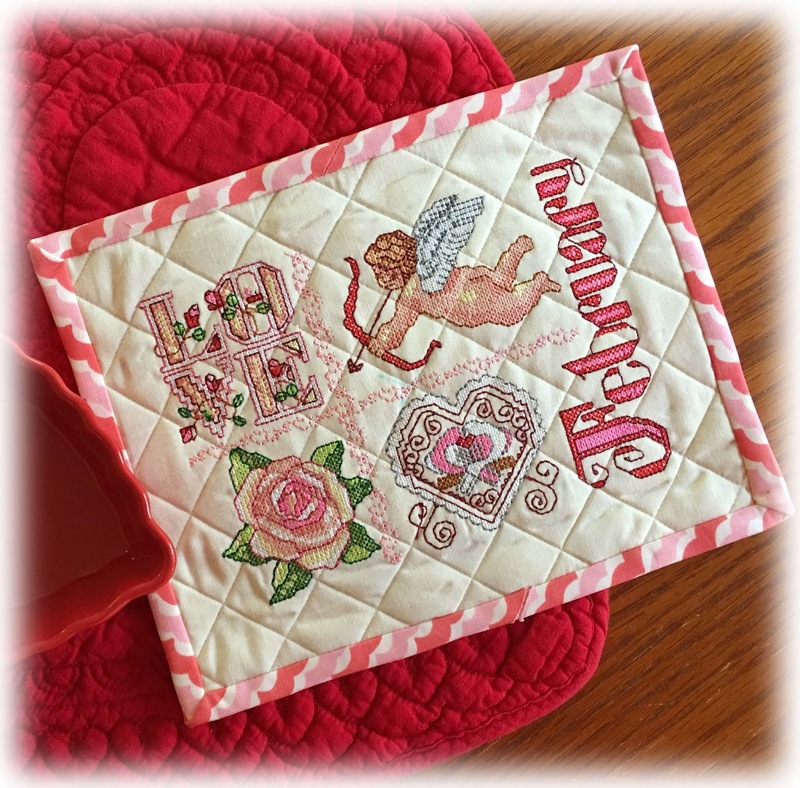 That doesn't mean you have to make a show quilt! We will be posting just a simple, free diagram shortly that shows "the easy way out," with cutting directions for an all fabric finish-- done in an afternoon! If you are game for more, there are two more steps-- embroidered sashing, then embroidered borders. You can do either or both. This is the "Sashing Kit" for the 4x4 size blocks-- it has already posted. 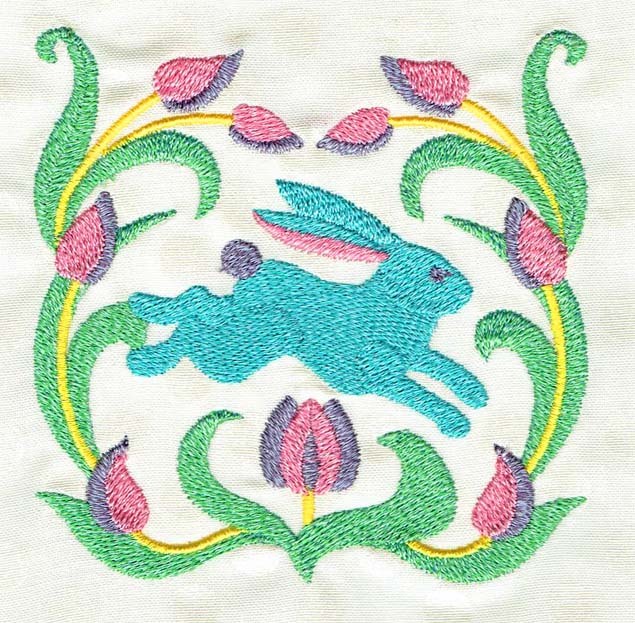 If you recall, we were looking for the perfect sashing fabric-- we didn't find it, so we decided to embroider it. Other than being repetitive, we are super pleased at how easily it went together. 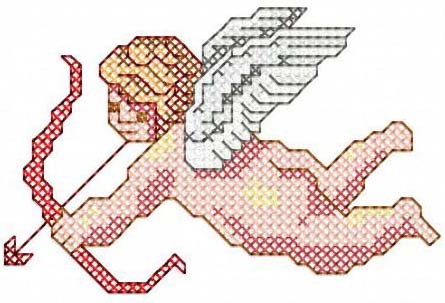 All of the parts have basting lines on them, and all you need do is stitch along the dotted line for perfect results. The instructions are super detailed, with photographs. wait for our beautifully embroidered borders! We have in mind a Christmas plaid with a red ribbon swag all around the edges. 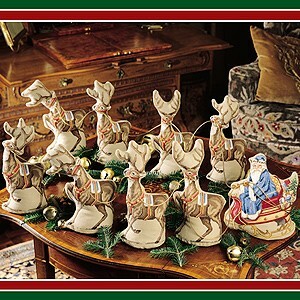 As with everything, we guarantee it's worth the wait-- and there's still ten months to Christmas any way! 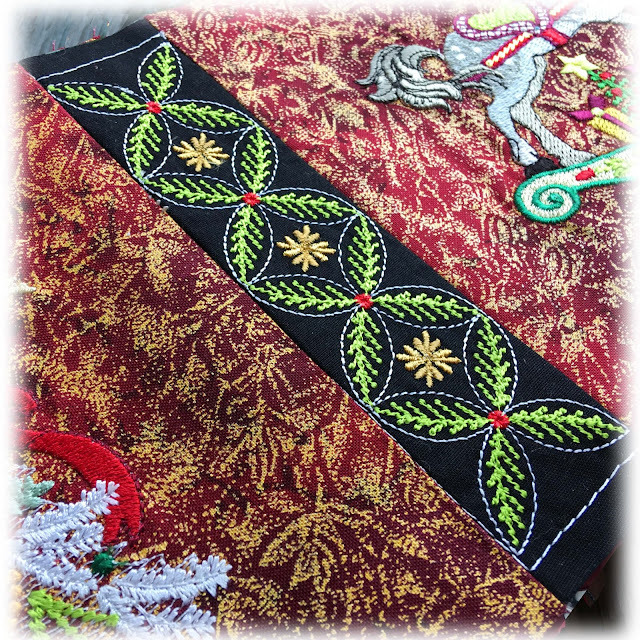 Since our Christmas Album customers will be kept busy with sashing for a bit, we're not tackling the border set until March. A couple of days ago, a SWARM of robins landed on our front step and looked in... by the time I grabbed my camera and everyone else ran to see them, only this guy was left. What were they looking for, I asked myself. The Cloud Club Finishing Kit. We will be actively working on it starting tomorrow, and I would estimate a finish by the end of the month-- then you can start stitching, and while you are working on your pieces, we will then write up some instructions. We're totally committed to five more birds this year to make a longer layout-- thanks to all for your encouragement to continue-- apparently, you loved them as much as we loved doing them. If you have a bird you'd love to see, comment below. Here's a sneak peek progress shot of March's cross stitch mug rug-- a little robin snuck his way onto this, too. Christmas Album Finishing Kit Peeks! 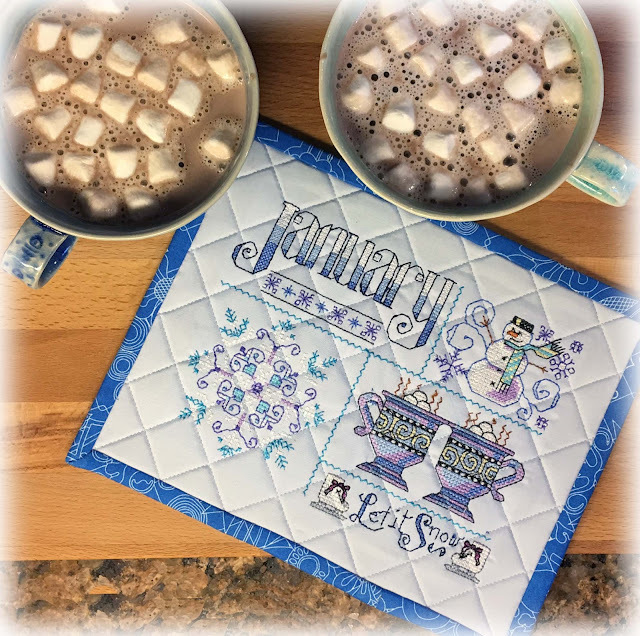 January was a super busy month! 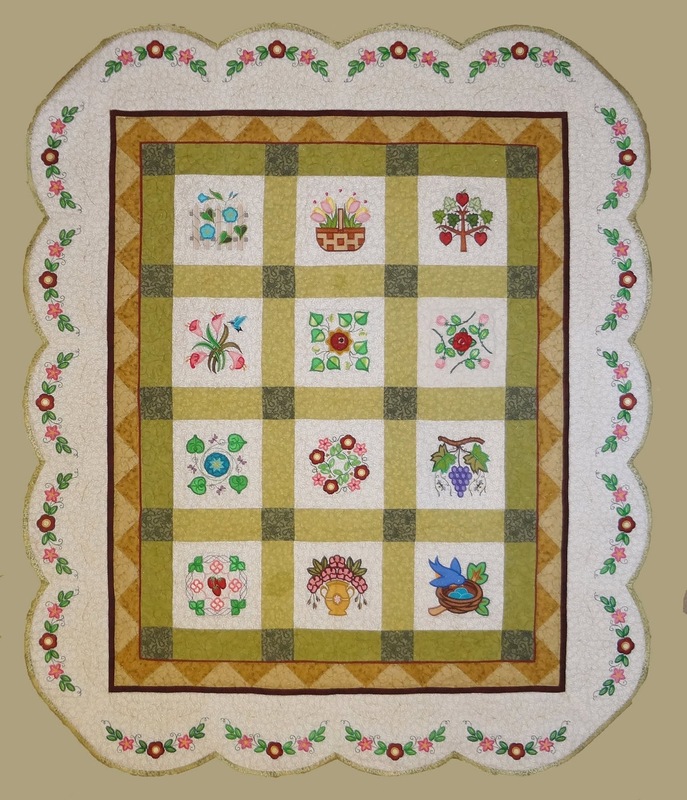 There are always so many thing to get wrapped up after Christmas, an office that needs a serious clean-up, and my friend Tere and I were invited to lecture and have a workshop at a local quilt guild-- Bayberry Quilter's of Cape Cod. It was a huge honor, as it is a group filled with very talented people. (Artist's always pick a great place to live!) Of course, in my excitement I forgot to take pictures. We had a wonderful time, and really enjoyed chatting with everyone after about their own quilting stories. We trimmed our large ones to 6-1/2" x 6-1/2" and our charm size to 3-1/2" x 3-1/2." There are three more designs to come, but they will be coming fast! Now that the calendar is clear, we hope to close this out by Valentine's Day... finishing kit and all. We have a 6-1/2" square ruler, and we taped a little 4x4 window on it, which made for accurate and quick cutting. We'll be posting a full tutorial on this later. Time to pick sashing fabric! This is always such a dilemma-- it is SO HARD to find the perfect one, and when we do, you want to buy it... and sometimes it isn't even available anymore. 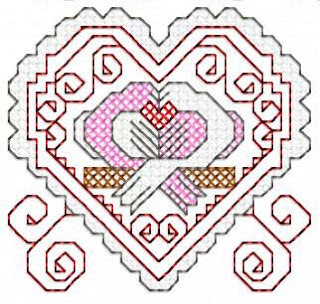 We had this great idea... we are all embroiderers, so why not embroider our own fabric? That ended up being much easier than driving from store to store, and searching online. So here it is! The top one we thought was a little too heavy, the middle one was a little light, but the bottom one was just right. hee hee. Trimming was so easy with the basting line, and sewing was just as easy-- we left our stabilizer in and all we had to do was stitch along the dotted line. Isn't that just so pretty! 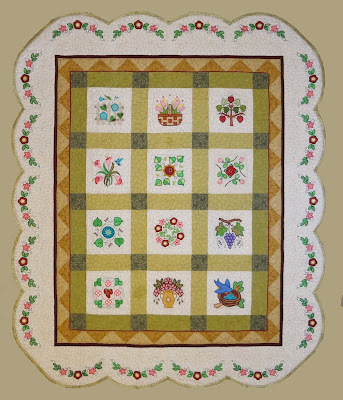 If you remember, our layout inspiration was the Caroline's Garden quilt, our first ever show quilt. So before you rush to buy, you can see we still need a cornerstone design, and a beautiful swag for the borders. But we hope we've given you the vision to re-energize your efforts, and a promise that then end is in sight. We seriously cannot wait to hang this up the day after Thanksgiving... thanks for joining us!